Fig. 47 Discriminating monopolist. A price-discriminating model involving two markets. The demand curve facing the monopolist in market A (Da) is less elastic than that in market B (Db). The horizontal addition of Da and Db gives Dt, and the horizontal addition of the MARGINAL REVENUE curves MRa and MRb gives MRt. 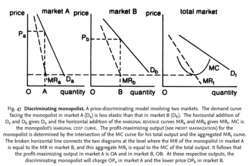 MC is the monopolist's MARGINAL COST CURVE. The profit-maximizing output (see PROFIT MAXIMIZATION) for the monopolist is determined by the intersection of the MC curve for his total output and the aggregated MRt curve. The broken horizontal line connects the two diagrams at the level where the MR of the monopolist in market A is equal to the MR in market B, and this aggregate MRt is equal to the MC of the total output. It follows that the profit-maximizing output in market A is OA and in market B, OB. At these respective outputs, the discriminating monopolist will charge OPa in market A and the lower price OPb in market B.
a monopolist (see MONOPOLY) who is sometimes able to increase his profit by dividing his market and charging discriminating prices. Apart from the requirement that the two markets are in some way distinct, such that buyers in one market cannot resell to those being asked a higher price in another market, price discrimination is only worthwhile when the PRICE ELASTICITY OF DEMAND in each market is different. See Fig. 47 . In principle, if a monopolist were able to charge each consumer the maximum amount that the consumer would be willing to pay for each unit bought, then the monopolist would be able to appropriate all the CONSUMER SURPLUS in the form of sales revenue. Would a price discriminating monopolist ever employ a price schedule that has the property that over some range of output marginal cost exceeds marginal revenue? This approach has both a conscious and a subconscious effect of making students suppose that something is more natural about the uniform-price monopolist and the associated problems than about the discriminating monopolist, notwithstanding the Pareto optimality associated with the latter's successful operation. The perfectly discriminating monopolist would work his way down the demand curve, eventually reaching point A as an equilibrium and Pareto optimum. Posner's discriminating monopolist would ring out as much profit as possible from each sale. A price discriminating monopolist (the Opera House) sells good and bad seats to two types of consumers. In effect, the cornerer acts as a discriminating monopolist, carefully regulating secondary market sales to earn all the revenue given by the area under the demand schedule. Now the cornerer acting as a discriminating monopolist, rather than maximizing profit, minimizes loss (the shaded triangle).